LIGHTING DESIGNER: Architecture & Light. CODE CONSULTANT: The Fire Consultants Inc. 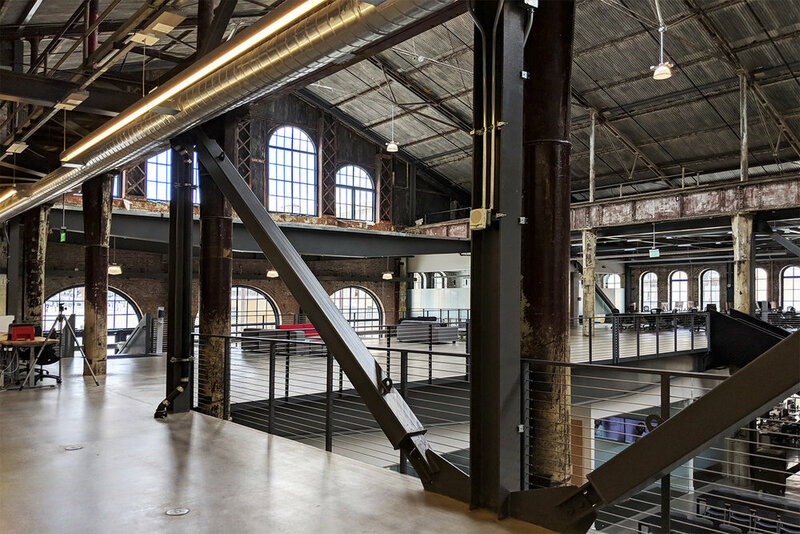 The Uber Advanced Technologies Group R&D Center is a significant part of the historic Pier 70, within the Union Iron Works Historic District, which today is regarded as the best preserved 19th century industrial complex west of the Mississippi. Once home to Bethlehem Shipbuilding, the Uber Advanced Technologies Group R&D Center extends the site’s legacy of transportation endeavors into the 21st Century. 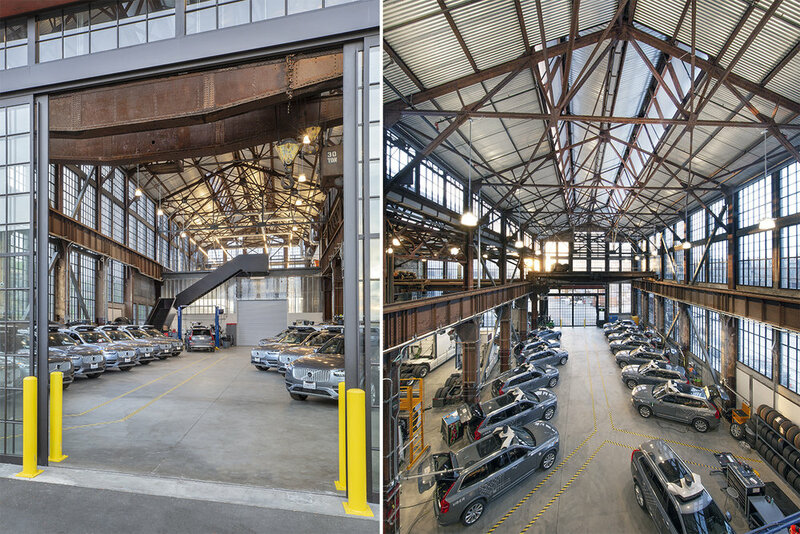 The project is housed in continuous historic industrial buildings (Building 113, 114, 115, 116), extending a length of two-blocks. The structures had been red-tagged for years -- the building conditions were beyond decrepit, and the danger of earthquake triggered collapse was so dire that the construction site included “safe areas” within the cavernous building for workers to take emergency shelter at a first tremor. It is to be expected that a 19thC building in San Francisco is not designed for earthquake. However, the Pier 70 buildings’ vulnerability was exacerbated by many years of vacancy during which vandalism, the stripping of materials and artifacts, and weather intrusion occurred. Uber Advanced Technologies Group is a self-driving technologies engineering team whose R&D Center is housed within this structure. 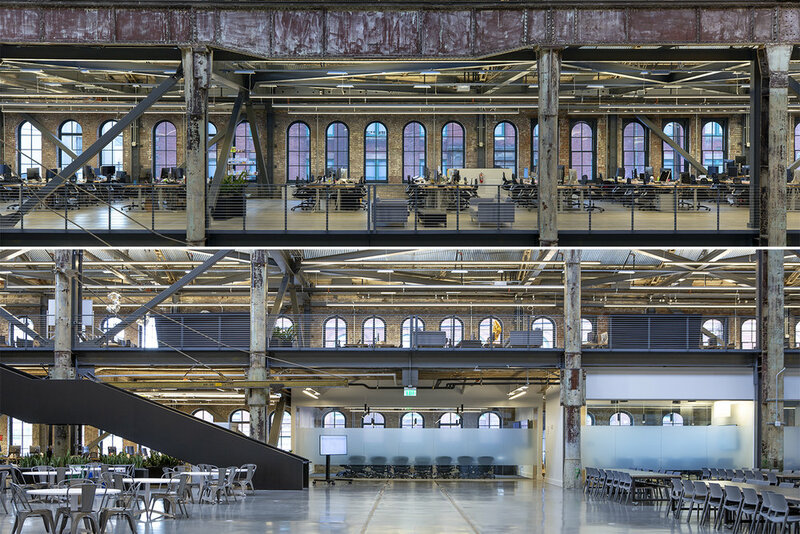 The project employs the building-within-a-building concept to preserve the historic perimeter brick walls, reducing the cost of temporary shoring while retaining the open volume of the tall spaces within. The dramatic volumes of the original structures are retained while the insertions of mezzanines, bridges and stairs not only create leasable space but act as internal diaphragms to resist lateral load. Conference rooms and other programmed functions are free-standing elements within the large volumes. 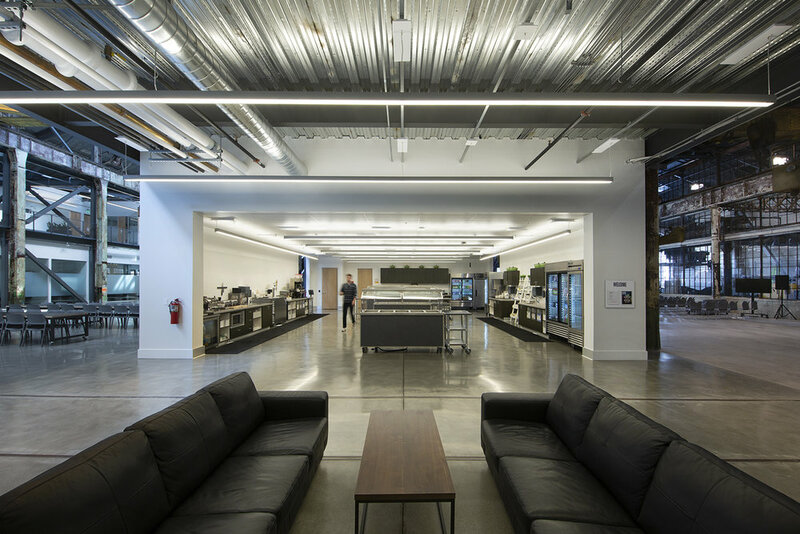 Lab, office, shop and kitchen spaces are located beneath the new mezzanine, aiding in sound isolation, temperature control and dust containment while retaining voluminous social and shared space at the center. 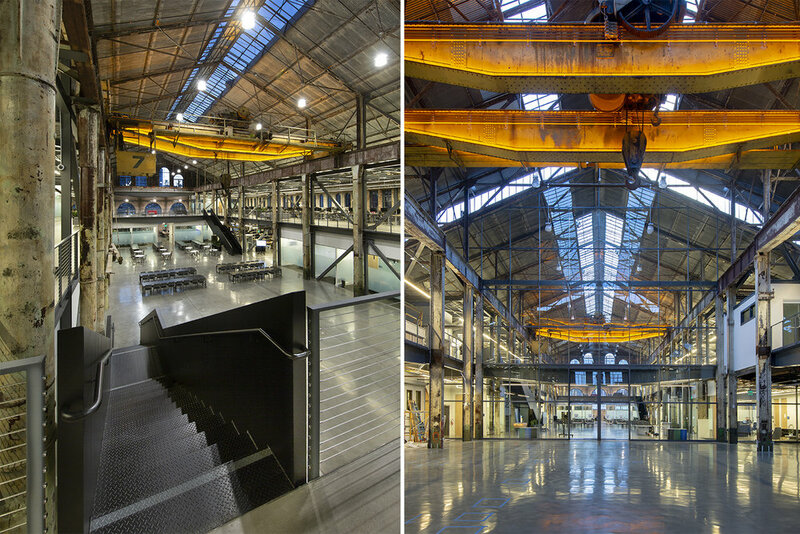 Architectural lighting shapes the spaces, defines functions and highlights emblematic industrial artifacts (such as the original yellow cranes). A major challenge in high seismic zones is the structural deficiency of old buildings. 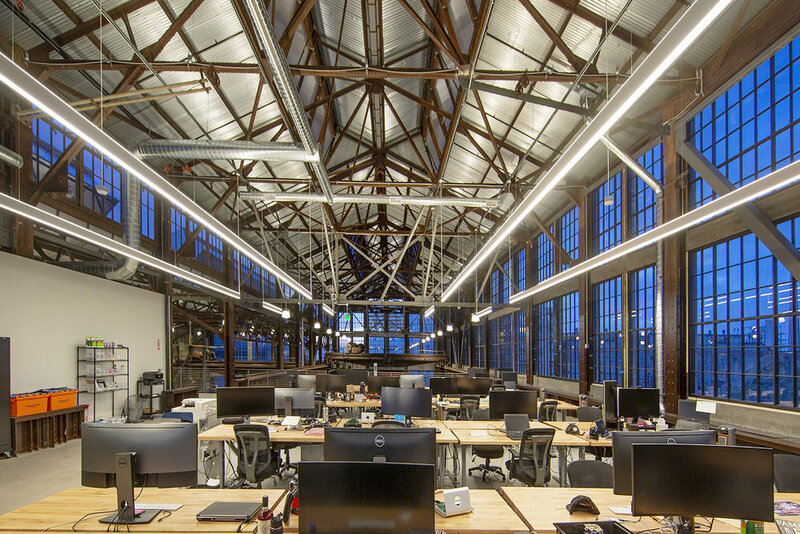 The new retrofit system is designed to resist a 500-year-recurrence seismic event -- steel columns and braces are strategically located along the existing building structure to minimize visual impact. 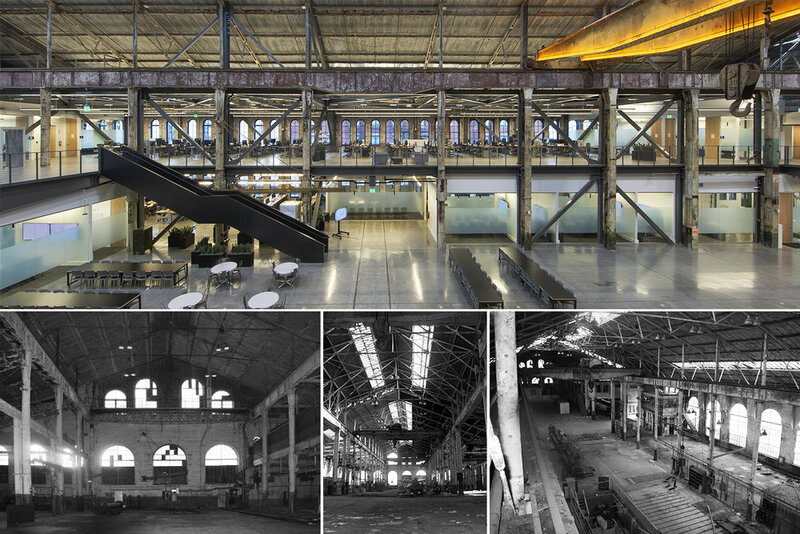 The project’s contribution to the community and industry is immense in that it revitalizes a crumbling shipyard facility into a vibrant place for work, and public gatherings. Precision craftsmanship is required to both refurbish deteriorated existing construction and accommodate new building components into the highly complex and diverse existing structures. The approach retains and repairs salvageable elements. If un-salvageable, the replacement element or material is specified to be historically compatible and environmentally benign.